65 - Aspect ratio. The tire’s chapter height as a percentage of its width. 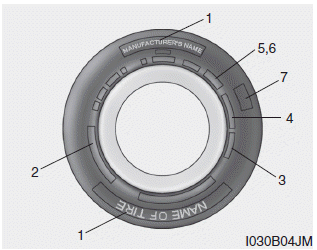 91 - Load Index, a numerical code associated with the maximum load the tire can carry. 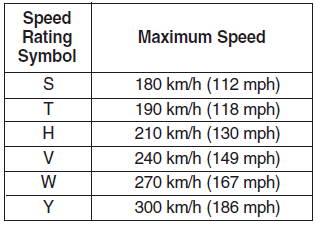 H - Speed Rating Symbol. See the speed rating chart in this chapter for additional information. Tires degrade over time, even when they are not being used. Regardless of the remaining tread, it is recommended that tires generally be replaced after six (6) years of normal service. Heat caused by hot climates or frequent high loading conditions can accelerate the aging process. Failure to follow this Warning can result in sudden tire failure, which could lead to a loss of control and an accident involving serious injury or death. Quality grades can be found where applicable on the tire sidewall between tread shoulder and maximum chapter width. Sustained high temperature can cause the material of the tire to degenerate and reduce tire life, and excessive temperature can lead to sudden tire failure. Grades B and A represent higher levels of performance on the laboratory test wheel than the minimum required by the law.